Today the student freedom movement went to the TSJ, the country's high court, for a very reasonable request: to ask the TSJ to rule that the vote on the referendum should be delayed. Not an unreasonable request since there are 69 articles to vote on and even this blogger has not read all of them yet, and less thought about all of them. In spite of previous violence the day went without a hitch with a 80 000 people march as reported by the AP. The AFP seems to have enjoyed the good natured aspect of the march, which was stopped at the Cuartel San Carlos where a delegation was picked up to meet Luisa Estela Morales of the TSJ. All went as agreed and we were even treated at lunch time to the speech of Goicochea and others to Morales (I was lucky enough to be in a restaurant with a big screen). So here is one colorful take of the march. And here a much less colorful aspect, reminiscent of some Star War clone movie. But troubles came from an unexpected quarter, the UCV campus where chavismo seems to have wanted to set a trap to come with an excuse to intervene it. 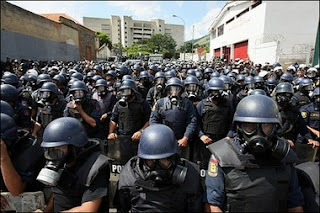 See, by Venezuelan law the state can only send its authorities in an autonomous campus only if asked for by the Deans. Except of course for exceptions such as finding a dead body in a classroom and then the CSI team is called for. But as the student movement shows no sign of abating and it is in the interest of the government to control the UCV, the biggest campus of Venezuela, too close from downtown for comfort. Thus, following the general instructions emitted by Chavez last Sunday, Carreño, the minister of lies (Montesinos? Direct TV? anyone) and police probably tried his hand (or the thugs that he does not control anymore took the initiative). 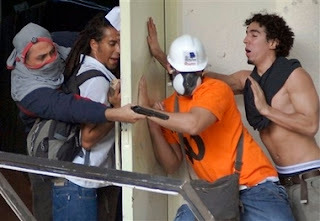 A few chavista thugs were sent in campus, with or without help of chavista students, that has yet to be determined, where they tried to create some trouble that would spin out of control. The black beetles were outside ready to step in. The pictures below tell the story (from AP, AFP or Reuters as all pictures of this post, not a single one from a Venezuelan media, which goes a long way to show how the international media has got of Venezuela crisis again). The opportunity would arrive when students coming back pacifically would be met by a pro Chavez mob. 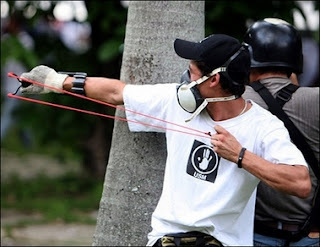 They were shot at but they responded in kind, though with slingshots to the firearms of the pro Chavez rabble. 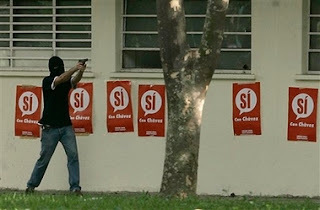 Worry not, the extensive weaponry of the chavista agents is shown below. At any rate, since there are so much more anti "Reforma" students at the UCV than pro "reforma"students (at least, no evidence of the contrary exists to date) the returning students had no trouble to force them in a building waiting for the cops to come and investigate. This is confirmed by the UCV authorities. First, the picture from where the thugs waited for something foul. Observe that the doors of the room are covered with SI posters, probably some pro Chavez meeting room within the UCV which speaks of the tolerance until today when chavismo broke it. You can also observe that the words of Carreño are already contradicted there: if chavista students were threatened by the lynching mob (yes, those were the ignoble terms used by Carreño) they certainly would like to show their faces to ask for help. But no, they are hooded, and holding big guns, unavailable and forbidden in campus. The threat level is clearly seen in these two pictures that are going around the world. 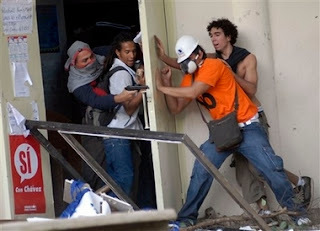 There were 9 students hurt/wounded today in the UCV. It is easy to guess which ones of this group were wounded if any. Eventually, holding superior fire power (we saw on video the Firemen sent to help throwing themselves on the ground and thus could not intervene), the chavistas made a run for it and joined a pack of bikes that broke in campus (not stopped by the police outside, by the way) and escaped campus. Amusing coincidence, is ain't it? that their biker friends happened to go by. All so "spontaneous"!!! Meanwhile those left behind did not find any humor in this shame. And we are left with this most symbolic picture which is also making the rounds in the press offices of the world. 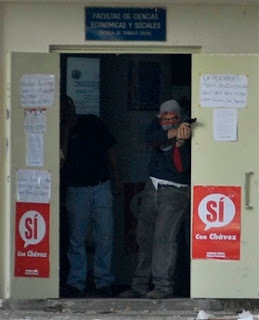 See, this hooded chavista thug shooting unarmed students is the perfect symbol of what the new constitution will allow Chavez to do with Venezuela: establish a totalitarian state. How many more pictures we will need to post, how many students will have to be killed until finally someone notices and says it aloud where ti matters? However I will leave you with a positive thought: for chavismo to resort to such awful tactics can only mean that they are scared, that the student marches are proving effective. 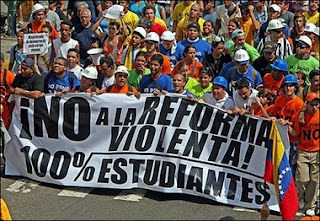 Today was a true triumph for the anti "reforma" movement more and more led by the students. their marches are getting under good control, their numbers are increasing, and they are happening all across the country. There is more, much more to come.